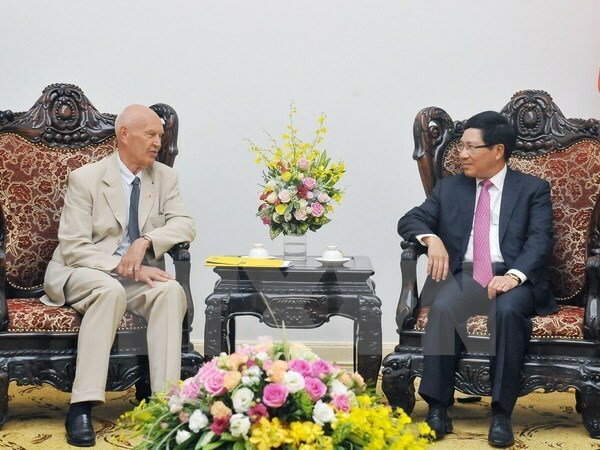 Hanoi (VNA) – Deputy Prime Minister and Foreign Minister Pham Binh Minh hosted a reception in Hanoi on June 3 for the special envoy of Swedish Prime Minister, Pierre Schori. Schori is in Vietnam to join the commemoration for the 30 th anniversary of the death of Swedish PM Olof Palmem, who laid the foundation for Vietnam-Swedish ties, contributing to tightening the friendship and closeness between the two peoples. Minh thanked Sweden’s support to Vietnam in poverty reduction, health care, energy, judicial affairs, rural development, and administrative reform, which he said, have made practical contributions to Vietnam’s development. Sweden is Vietnam’s important economic partner in Northern Europe with two-way trade topping 1.2 billion USD in the past three years, he said, adding that both countries should tap the long-standing foundation to deepen political-diplomatic ties, enhance trade-investment and extend joint work to the fields of education-training, science-technology, green technology, transport, maritime security, the environment and marine-based economy. Schori, in reply, recalled Sweden’s support to Vietnam in its past national reconstruction, evidenced by the construction of the Vietnam National Hospital of Pediatrics, the Vietnam – Sweden Hospital in Uong Bi, Quang Ninh province and the Bai Bang paper factory in Phu Tho province. He also extended a message from the Swedish government and PM Stefan Lofven, wishing to deepen the special ties across the economy, education-training, science-technology, maritime safety, marine environment, water resources and marine-based economy.